“You can be social, have a good time and still be a human being and go to work the next day,” said Justin Bishoff, manager of the Denver-based GroundSwell cannabis dispensary. Cannabis sales leaped 40% last year on the Saturday before the big game and this year could rise even higher thanks to California’s recent legalization of recreational marijuana, according to Green Bits, which runs sales systems for more than 350 dispensaries in six states and compiled stats for USA TODAY. Weedmaps is highlighting Super Bowl specials in Arizona, Michigan and California, with more expected closer to game day. At Denver’s GroundSwell, workers are offering deals on marijuana-infused sodas, riffing off the beer-drinking culture of the Super Bowl. 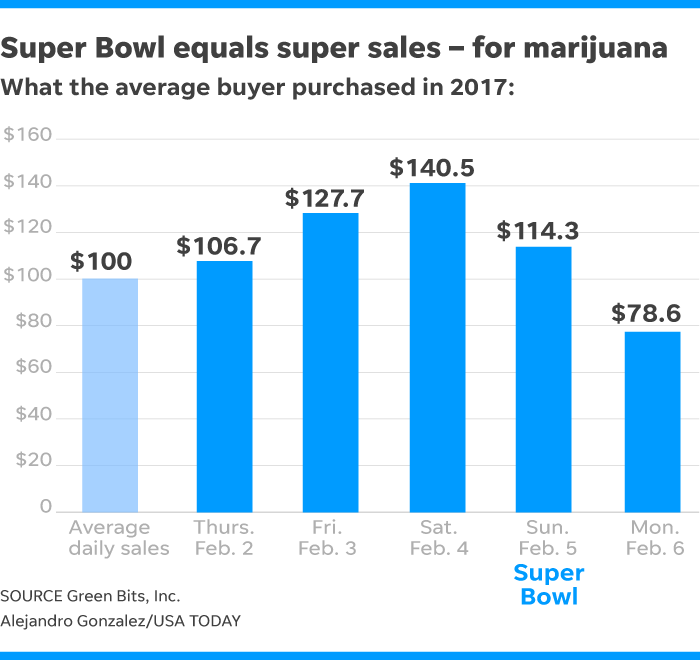 In Las Vegas, marijuana store Blum is offering a special deal on Super Bowl day itself: Buy $30 of marijuana, get $8 more for just a penny. Until then, the company’s four Nevada stores are running a Super Bowl-related raffle, said Mikel Alvarez, vice president of retail operations for TerraTech Corp., which owns Blum. Alvarez said he’s also working with the company’s two California stores on Super Bowl-related specials. “We’re having some fun with it,” he said. “You go out with friends and it’s amazing how many people aren’t drinking as much. They’re using cannabis instead,” Alvarez said.